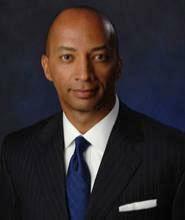 *Byron Pitts was born on October 21, 1960 in Baltimore, Maryland where he was raised by a single-mom who saved to send him to Catholic school on a modest seamstress’ salary, despite the fact that they were churchgoing Baptists. Although he would eventually embark on an enviable career on TV as a well-respected news journalist, Byron had to overcome illiteracy and a host of other seemingly-insurmountable childhood challenges en route to turning himself into a great success story. That admirable endeavor was intimately recounted in his revealing memoir “Step Out on Nothing,” a best seller which earned the #2 spot on my annual Top Ten Black Books list. Robertson Treatment: I’m going to start off with a question from children’s book author Irene Smalls. She says in many ways yours is a true rags-to-riches story. What guidance can you offer young people today? RT: How did you overcome the obstacle of illiteracy? What did you do to rebuild your self-esteem? RT: we are a part of something much greater than ourselves. If this is true, when did you discover this truth and what has it meant to your success? RT: shows like The Daily Show and The Colbert Report illustrate a convergence and permeability of news, entertainment, politics and marketing called “discursive integration.” She wants to know, if you think this confluence will have more of a positive or negative impact on news in the future? RT: how we can achieve greater integrity in journalism today? RT: Aspiring actor Tommy Russell asks, as a black man who is also a very public figure, do you think black male celebrities, entertainers, sports figures and politicians get treated more harshly for their transgressions and mistakes than others? RT: Tommy continues with, since the election of Barack Obama, do you think America has entered a post-racial period in our history? RT: Is there any question no one ever asks you, that you wish someone would? RT: Okay, what’s the one thing in life you know for sure? After a long travel day I finally made it to Washington DC’s National Airport. Totally exhausted and ready to complete the last leg of my journey, I was ready to get into a smart and reliable car, which is exactly what I found with the Dodge Journey. Wow Factor: From its smooth exterior, roomy interior space and solid on the road handling, the Dodge Journey satisfied all of my driving needs during a series of test drives that took me from DC to Baltimore, Philadelphia, New York City and back. Ride: Outfitted with a V6 engine, a solid transmission and superior shock system, the Dodge Journey was able to handle both big city and open road drives with ease. My ride had great responsive steering and equally responsive brakes, which provided me with good confidence on the road. Spin Control: The Dodge Journey provided me with a supremely functional ride that delivered on all of my expectations. Starting with its on-the-road reliability, competitive gas mileage and affordable price tag, it should have great drivers across various demos. Copyright 2010, Robertson Treatment all rights reserved.